Angry child on Halloween. A funny child with a painted face. hd00:11The painted face. Child Halloween. A terrible child. Painted skull. hd00:08A terrible child. 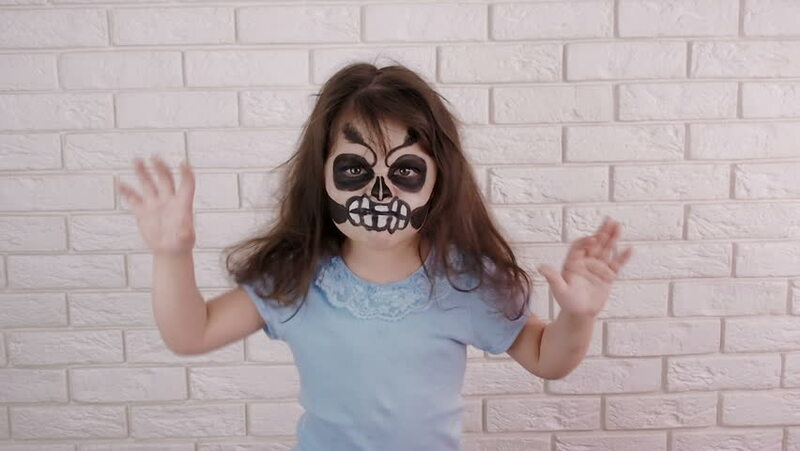 Child With a painted face scares. hd00:13Angry child on Halloween. A funny child with a painted face. 4k00:18Portrait of woman with long hair and hat wearing a carnival mask standing in Venice street in Italy looking at camera. hd00:24Evil queen. Halloween. Day of the Dead. hd00:19A model on a white background. The woman put on a carnival mask. hd00:11A man with a terrible make-up in the form of a zombie he hugs the girl, he puts his hand on her neck and tries to strangle her. Couple in vampire costumes in Studio. Halloween or horror concept.